The DDP's Office is asking the High Court to make sure Mahendra Chaudhry can't access funds kept in his Australian accounts if he's granted permission to travel to Australia. 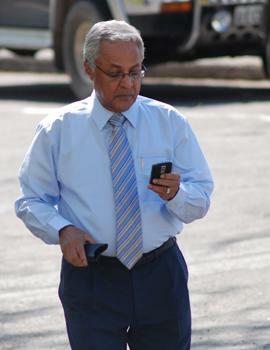 Fiji media say Chaudhry has asked the court to allow him to have his passport so he can travel to Australia for medical treatment. DPP lawyer Ana Tuiketei has not opposed the application for Chaudhry to travel but says the Fiji Court needs to make sure the Fiji Labour Party leader can't access the funds kept in his Sydney accounts, because they are subject to the charges and on-going investigations. Tuiketei also argued the former Prime MInister is not entitled to unconditional bail because he needs to be treated like any other accused persons. Chaudhry's defence lawyer and son, Rajendra Chaudhry, cliamed the bail act allows an accused to access funds for various reasons. According to FijiVillage he also said his client will need to access the funds to pay his medical bills. He gave an assurance that the monies to be used will be for travel, medical bills and other expenses within reasonable bounds and his client will not tamper with the funds as alleged. High Court Judge Justice Daniel Goundar also questioned Rajendra Chaudhry why his client's passport should be permanently released to him. He questioned on how the court can guarantee that someone prominent, with power and money will not abscond. Rajendra Chaudhry argued that this could lead to the presumption that prominent people are treated differently when it comes to bail conditions. If they let him go he will be gone permanently. Will stay in Aus and apply for protection visa claiming persecution by the military regime and will most likely be given one. How exactly they will be able to restrict his funds in Australia is a mystery. Grant him his visa and at the next court hearing when Justice Goundar enters the courtroom, the court officer will say to those present 'All rise...All raise your right hands.....All wave goodbye to Chaudhry and the money". Justice Goundar should be mindful that the Indian govt. aided and abetted MC's money laundering scheme through its high comm. in Aust. He is definitely a flight risk. he will never ever return. After all, wasn't that money allegedly intended for his relocation to Aust? What medical condition is he suffering from? So are other poor farmers, whose money he stole. DO NOT LET HIM GO. I can't even be bothered finishing reading this topic. The whole thing around Fiji is so laughable now. Illegally appointed Magistrates by an illegal Regime, trying to preside over a case involving a Member of parliament who once promoted and worked withe the illegal Regime and defended by a son as corrupt as the Father he represent. Agree wholeheartedly with previous writers - if this career criminal & serial liar is allowed to leave Viti - Justice Goundar should be removed from his position. Should sanity prevail? After he's done with current charges there's the small matter of the multi million $ Mill upgrades scam. Note again how Indians always assume the "victim" position. India key - 50 50 Australia will grant him asylum - 100% India will. Lets wait & see? Have this strange feeling Justice Goundar might not be as naive as both Chaudhry's believe he is? "DDP lawyer (Ana Tuiketei)has not opposed the application to travel". "Asking the High Court to make sure Chaudhry can't access funds kept in his Australian accounts". Given Chaudhrys past form - why didn't she (they DDP) oppose it? This person a lawyer or someone they found at Suva Bus Station? Somebody please inform her the Fiji High Court cannot impose orders on other juristictions. Unbelievable. "Ana Tuiketei" - remember that name should ever neeed a lawyer. Pails & Really Big Front End Loaders. If regime via DDP naively believes by letting this serial liar & thief leave Viti he won't unload on them - suggest they think again? Why do you think MC objected to Goundar hearing his case? He asked for an overseas judge for this very purpose ie, to abscond. This brings Ballu to mind. Remember, the judge granted a permanent stay of prosecution? It is easy to do the dealings off shore to avoid detection. Under no circumstances should MC be allowed to leave the country. If the man who held a gun at MC's head can get assylum in Aust, what will stop MC from getting one? Don't forget the Labor Party connection? Plenty of naive dysfunctional ones in ALP - experienced conman like Chaudhry would have no trouble with them - eat them for breakfast. Agree - under no circumstances should he be allowed to leave Viti. Lets wait & see - show faith in Justice G.